Gleim CIA Review System is the most widely used CIA Certification study material on the market. Gleim CIA Review System includes everything you need to pass the CIA Certification (Certified Internal Auditor) Exam and is available as a set and offered for each individual part. 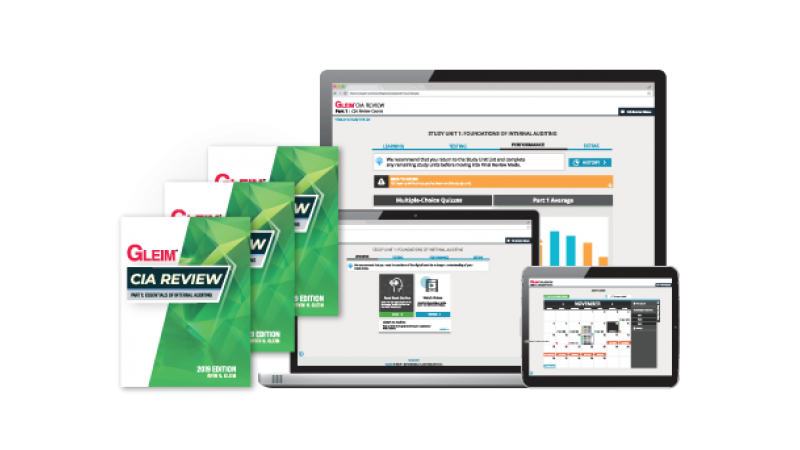 This system integrates all of the available materials into an easy-to-use, three-step study approach featuring adaptive learning technology so candidates can diagnose weak areas, study from review materials written by professional educators, and apply knowledge with the largest test bank of Multiple-Choice and Focus Questions on the market. Each CIA Review System includes books, online courses, unlimited practice exams with our exam-emulating test bank, Personal Counselor, and our interactive Study Planner. Gleim Online – This online course is your main study tool in this guided, self-study review. Gleim Online includes your interactive study planner, exam-emulating quizzes, the Gleim digital book containing comprehensive outlines and examples, and Audio Lectures. You will also have access to your own mentor, a Personal Counselor who will offer advice and support while you're studying for the exam. Gleim CIA Test Prep, Audio Lectures, and Exam Rehearsal™ – Want even more practice and review? Gleim CIA Test Prep is the most widely used question bank on the market. On the go? Take advantage of nontraditional study time by using the Gleim Audio Lectures component of your review system, which encourages auditory learning and includes lectures of the most important concepts from the Gleim books. Finally, during your comprehensive final review, take the full-length Gleim Exam Rehearsal, which will help to identify your weak areas. Both the Gleim CIA Test Prep and Exam Rehearsal emulate the Pearson Vue testing environment and provide detailed answer explanations for both correct and incorrect answers.